The governor said Tuesday it would be the first application of such a regulation, designed to create more visibility of the controversial oil extraction method. The plan was immediately criticized by environmentalists for being “too lenient.” They fear pollution of underground water supplies. Proposed by the state Department of Conservation, the new rules, if initiated, would require oil producers to monitor sites where such techniques were being used, test integrity of wells being subjected to hydraulic fracturing, to notify state regulators when they plan to use the technique, and to disclose the chemicals being used. Exception would be made where chemical contents are a trade secret. 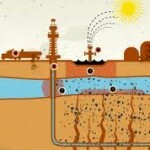 In fracking, water and chemicals are injected into the ground to break up rock, releasing trapped oil reserves. “Experience in other states has shown that such trade secret exemptions are being widely used and likely abused,” the Environmental Working Group’s Bill Allayaud said in a prepared statement. Scientists from Cal Deck have established that there are several other energy producing areas where ‘fracking’ may be suitable, with minor negative impacts on the environment. Empirical studies have shown that if 100 men, above the age of 40 years, have their scrotums pulverized through fracking via champaign & pesto injection, they will produce enough fuel by-products to power a small lawnmower for 20 minutes. I wasn’t aware we had a Department of Conversation… I think you mean Department of Conservation. Correction made… thanks. But “Conversation” is a good idea right now. Seems like a good “baby step” in the larger strategy to chase those that produce things out of the fair state of California.